Is the delicate combination of their fragile beauty and ruthless thorns? Countless variations of shapes, sizes, colors and fragrances? Why are roses romantic? And why are so expensive? How they earned their tremendous symbolic power? Here is my top 10 of amazing facts about roses! A challenge or a dream? 1. First roses were cultivated in Asia, very likely in China. Today we can find them all over the globe, if only weather allows that. The largest exporters of roses are developing countries like Ethiopia, Ecuador and Kenya with cheap labor workers. 2. Majority of roses are hybrids. They are not grown from seeds, they can be cultivated only with a help of grafting, what means A LOT of manual work which always comes expensive. 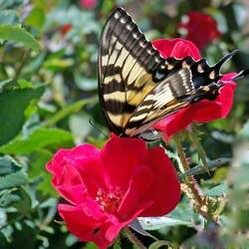 Roses also need soil rich with nutrients, a lot of water and heat. Although they are always in demand in the market, there is a very special day - Valentine's of course - when hundreds of millions of roses are sold all over the world in only few hours. Because Valentine's in Northern Hemisphere is cold, roses for this specific holiday are grown with a help of artificial light and heat (mostly Netherlands) or transported (by planes and refrigerated trucks!) from Africa (to Europe) or South America (to North America). All these cost money. It is not environmentally friendly either. ... name your son Rose? 3. Rose is popular given name. It is not necessary related with flowers. For instance it very likely came in Great Britain in 11th century with Normans. At first it was spelled Hrodheid from hrod (meaning fame, glory) and heid (sort of, kind of). It faste changed to phonetically related Rohese, Roese and finally Rose. This heroic name had fallen out of favor few centuries later and regained popularity only in 19th century, this time as name related to flowers (many languages use the same word for 'flower' and 'rose') and was meant for girls. On the other hand the surname Rose and its numerous variations (think Ruskin, Larousse, etc.) can come from flowers (maybe family living where the roses grow) or have older, more 'manly' origins. what really means: important is the essence, not the name. 4. It is widely accepted symbol of beauty and love, purity and passion, honor and devotion. It is a sacred flower related to several goddesses. Flora, goddess of spring, is often attributed as creator of roses. But on the other hand she created other flowers too. Old Greeks believed a garland of roses can prevent a drunk man to reveal his secrets. This is probably the reason this beautiful flower is also a symbol of secrecy and silence. Temples in Greece and Egypt were decorated with roses during ceremonies used to initiate candidates into mysteries. Freemasons still love to include them in their coats of arms and other insignia. 5. Thanks to its seven petals (seven is number of perfection and universal knowledge) a rose is also associated with the ultimate understanding and wisdom. Roses were very popular in alchemy. As symbols and as source of precious essential oil. But most of roses in nature have five petals. 6. In Christianity red roses symbolize martyrdom and immortality and whites symbolize Mary's purity. In Medieval times only virgins could wear rose garlands. Just take a look of portrait Madonna's portrait on the right. 7. Every color carries its special symbolic power. So what are the meanings of rose colors? Please note, blue and black roses do not occur in nature. Although some sorts were produced through genetic engineering, they are mostly made by dyeing white roses. 8. Roses are popular motif in tattooing. The combination with a skull gives a possibility of extremely powerful contrasts of black or white with color red for love and death in the same design. 9.We can start with Snow White and Rose Red, a fairy tale by brothers Grimm, where two rose trees symbolize two daughters gradually growing into women. In Sleeping Beauty which is actually titled Briar Rose in Grimms' version, a hedge of thorns protects the entrance to the castle until the right man shows up (allusion to virginity is obvious). Other writers loved roses too. In Beauty and the Beast the stolen rose starts all sorts of problems, all related with love, fear, jealousy and similar powerful feelings. We should not forget Hans Christian Andersen. The Loveliest Rose in the World is one of his less known fairy tales with strong religious connotations. The Nightingale and the Rose by Oscar Wilde on the other hand carries much more cynical message but it is still extremely beautiful. Don't forget rose essential oil! "How many roses do we need to make essential oil?" "About 50 or 60 thousand for just one ounce (30 ml) of rose oil which costs from several hundred to several thousand dollars, thanks for asking!" Rose essential oil is rarely available in pure form. Even heavily diluted it has many health benefits and is one of the most popular essential oils in aromatherapy. It works against depression, inflammation, spasms, acid reflux,... Well it is well know aphrodisiac too, but you already knew that, right? Do you prefer growing, buying or getting roses? I like growing them, but I never mind getting them either. Wow I really enjoyed reading this. I love most flowers, but roses are definitely special. Glad that I read this in June, the month of roses :) My favourite is the very light pink roses which are highly fragrant. I had them once but they were quite difficult to grow compared to the usual red and pink roses. Thanks for writing this beautiful page. They are really special, aren't they? I like roses period, no matter where I see them. Getting, I am a lousy gardener and I don't buy them for others very often. @sheilamarie Red is a classic, just like Ferrari, I suppose!